Derived from a word found in Native American history meaning "a dry fruit," a persimmon is an edible fruit grown from a variety of trees found throughout the world. Both astringent and non-astringent types of persimmons are available in markets. The Caucasian persimmon tree, located in areas of the United States, and the Japanese persimmon tree, found in Asia, are two of the persimmon-bearing tree species. Also known as the black sapote fruit and found in Mexico and Australia, the black persimmon is usually under 4 four inches wide and features a flattened top surface. While it is usually completely seedless, it sometimes contains five seeds in its center. Black persimmons, used in many Mexican dishes and puddings, turn from green to deep brown as they ripen. Trees that produce Caucasian persimmons, usually cultivated on American commercial farms, can grow up to 80 feet tall. They produce cherry-sized persimmons with a green-yellow coloring. These persimmons have a distinctive sweet and sour taste. Japanese persimmon trees grow in Japan, China, Burma and the Himalayas. 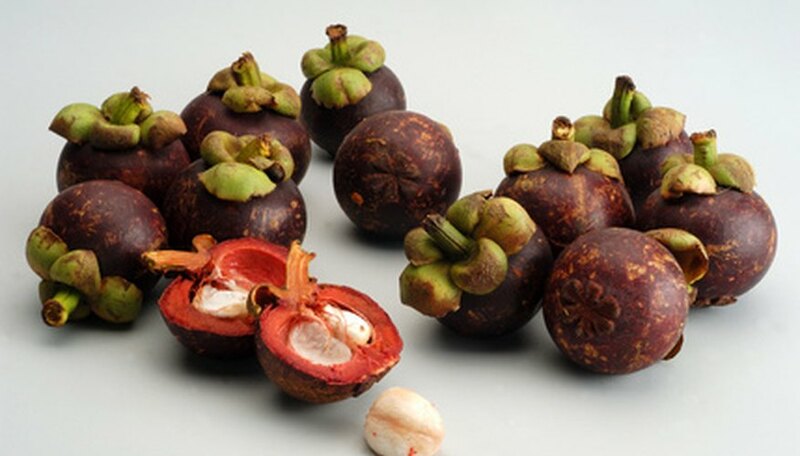 Their fruit, which has a smooth and glossy feel, changes color from yellow to orange and red to brownish-red as the fruit ripens during the fall. Japanese persimmons taste very bitter unless the fruit is fully ripe when it becomes much sweeter in overall flavor. Featuring a golden-orange coloring when completely ripe, American persimmons are an ingredient in pudding, preserves and even beer. Averaging about an inch in diameter, American persimmons become soft to the touch when fully ripened. Like the Japanese persimmons, they taste bitter before they are completely ripe. American persimmon trees grow all over the United States.